You might be asking yourself how to speak German, so I’m writing this to introduce you to the natural approach to language learning. It is a revolutionary language learning method to learn a language: You can learn German automatically, like a baby! No more sitting in boring classrooms, listening to a teacher droning on about grammar! TL;DR: Second language acquisition is like first language acquisition. Read and listen to a lot of German. Don’t worry too much about grammar. Don’t force yourself to speak, you will naturally learn how to speak German. What is the natural approach to language learning? The natural approach was developed by Stephen Krashen and Tracy Terrell, based on Krashen’s scientific theories of language acquisition. They published their results in their book The Natural Approach: Language Acquisition in the Classroom. The goal is to develop communicative skills, so if you are asking yourself how to speak German, this method will help you! The idea, essentially, is that second language acquisition (i.e. 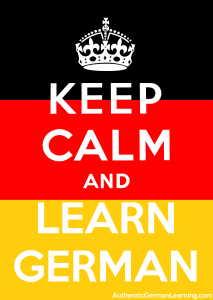 you learning to speak German) is basically the same as first language acquisition (how you learned your mother tongue). 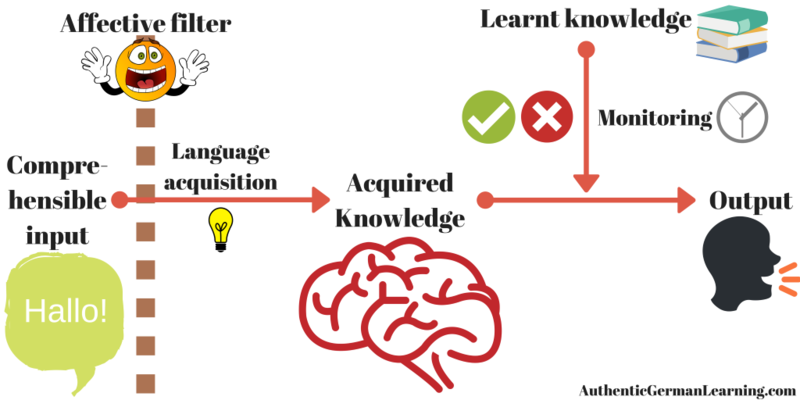 There is a strict separation between conscious learning of language (rote learning) and subconscious acquisition of language (“picking up” a language). Learning means you discover the rules of a language. Acquisition is developed by using the language meaningfully. Only acquisition can lead to fluent language use. When you consciously learn German (or any other language), you can only use it to monitor output, not to generate new language. That means you can correct yourself by thinking of the right grammar rule, but not think of new phrases to say. have enough time to apply the rule. This hypothesis states that you acquire a language (e.g. practice speaking German) by being exposed to it. But watch out: It has to be so-called comprehensible input at a level that is a little higher than what you can already understand. Krashen calls this kind of input “i+1” (with i representing your level). You acquire the grammatical features of a language in a certain order. This order is fixed and it does not even matter how you are taught! Your emotional state and attitude counts. Krashen proposed an affective filter that freely passes, impedes, or blocks input necessary to acquisition. So in order to acquire a language effectively, you need to be relaxed and open to learning. If you are nervous or distressed, you may not learn features in the input than more relaxed learners would pick up with little effort. Motivation. Learners with high motivation generally do better. Self-confidence. Learners with self-confidence and a good self-image tend to be more successful. Anxiety. Low anxiety in the classroom and in general is more conducive to second language acquisition. We acquire a language only by understanding messages. No pressure! When you relax, it is easier for you to learn German. Only when you acquire the German language can you speak fluent German. 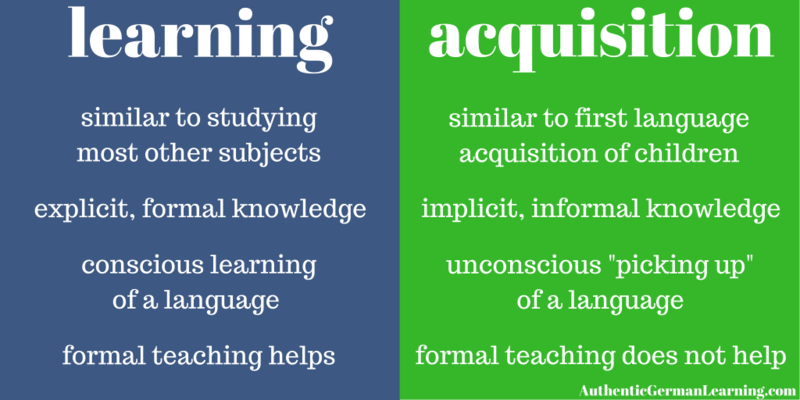 Learning cannot lead to acquisition! Speaking only indirectly leads to acquisition! Since meaning is the essence of language, vocabulary (not grammar) is the heart of language. Learning vocabulary and grammar rules by heart only has limited value. I think it’s good that you remain skeptical. You have every reason to be, after all, there are some people who still teach with grammar drills. On the one hand, the natural method is logical. If a baby can learn a language in this way, why can’t we? In addition, we save an extra step: When we learn a word in context, we get a sense of the meaning. But if we translate the word every time in our native language, we have to make an extra step. When we learn grammar intuitively, we have a sense of how we apply the rule. But when we have learned an abstract rule by heart, we find it difficult to use it, because we have to go through the whole list of use cases and exceptions in our head. Moreover, I can say from personal experience that the natural approach to language learning works! After I learned Italian for a few months, I felt stuck. Learning was less and less fun for me. Since I use the natural method, learning is not only more fun, but I find it much easier. I read inspiring articles on interesting topics and exciting novels. When I’m out and about, I hear audiobooks and podcasts that appeal to me. This is a thousand times better than to endlessly translate short, disjointed sentences. Once you use this method, in only a few weeks you will see for yourself how your German is improving! In addition, there are numerous scientific studies supporting the hypotheses, many of which are cited in the aforementioned book The Natural Approach. Finally, I cannot ignore all the positive feedback that you all give me regularly. I regularly get messages from my students how great you find my material and how it inspires you. So much for the theory, but what about the practice? …or acquire, rather! Remember: In order to speak German fluently in the future, you need to acquire, rather than learn the language. First of all, you don’t need any drills or constant error correction. You don’t need to repeat things over and over again. That will just frustrate and bore you. A teacher (who is using the natural approach to language learning) will correct errors by incorporating the correct phrasing in the reply to the student. Since the focus of the natural approach to language learning is to get comprehensible input and reduce the student’s anxiety, you need to find German audio and texts that interest you and which you understand to about 70%. Since the affective filter hypothesis states that you need to be relaxed and open to learning, your mood is a major factor. Always watch your mood! If you don’t feel well studying German, try to find out why and fix it. If you are learning German and you are not having fun, take a break and figure out what can make it fun again. It can also be very helpful to play games, discuss ideas, share opinions and solve problems with other language learners and the teacher. Always focus on meaningful vocabulary, that means you learn it in context, via example and most importantly: by understanding meaningful messages. To paraphrase Eminem, “lose yourself in the music” of the German language. When you forget that you are learning German and focus fully on the message, that’s when you learn most effectively. In my German videos, I talk only in German (except some rare instances) and everything I write is available in German so that you have the input you need for acquisition. If you have any trouble understanding the German input, I offer translations in English (and if a helpful volunteer made it, other languages). However, I advise you to use these translations sparingly. I rarely correct people since it doesn’t really help, except in rare instances. I encouraged you to leave comments, write in public forums I created, and share videos of yourself speaking German there so that you use the language to talk about your ideas. You can join these German learning communities here because I want you to be part of a community and experience learning German together with your peers. In the Authentic German Learning Academy, I give you plenty of opportunities to perform tasks and solve problems using the German language. One weakness of the natural approach to language learning used to be that not all content is interesting and relevant to all students. Well, the Internet solved this problem! Now you can choose yourself which content you want to use first – there are plenty of courses in the Academy and many different categories on this website. Consume as much comprehensible input as possible. Use whatever helps you with comprehension and expose yourself to a wide range of vocabulary. 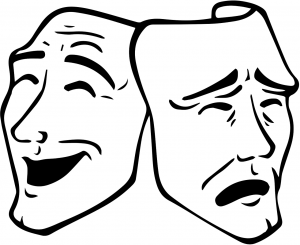 The input should be interesting and contribute to a relaxed atmosphere. Your focus should be on reading and listening to German. Speech production comes slowly and naturally. It goes through natural stages (yes or no response, one-word answers, lists of words, short phrases, complete sentences). Don’t force yourself to speak German! Concentrate on the meaning, not the form. You see, learning German can be easy if you use the right method! In my opinion that is the natural approach to language learning. First, focus on vocabulary knowledge. Once the vocabulary has gone to long-term memory, you can answer simple questions and use single words and set phrases. Finally, you will naturally feel an inclination to speak German. It’s very important to note that the first phase is a silent period, so it’s not bad if you have trouble speaking German! If you cannot speak German, remember the five hypotheses, especially number 3 and number 5: Relax and learn German by getting as much comprehensible input as you possibly can. But what if I still make mistakes? With respect to the natural order hypothesis, it’s also important to note that it’s completely normal if you can speak some German but make some mistakes over and over again. That just means that you haven’t reached that level yet in the natural order! Since the natural order hypothesis holds true, if i is your current level, you always only acquire your current i + 1, so you need messages that are just slightly beyond your current level of competence. That is especially true if you combine it with something fun, like personal development. It’s possible when you use the natural approach: the topic you are reading or listening about (in German) can be about anything and you automatically learn all the German words that are used and the grammar rules. In this way, learning German becomes fun and interesting. That’s the whole reason why I created Authentic German Learning and the Academy in the first place: to make German learning interesting and fun for you. Does the natural approach say that you should never learn German grammar rules, or learn German words and phrases by heart? Not at all! The point is not to learn no grammar at all. The problem is just that many teachers want to teach grammar too much and too early. Besides, learning German grammar can be fun – for some. If it’s fun, go ahead! That will lower your affective filter (remember hypothesis #5?). And what if you want to become a translator or write a speech? Then you absolutely have to know German grammar in order to not make mistakes. With that knowledge and since you have enough time, you can use the monitor (see hypothesis number 2). Remember: You need time and knowledge of a rule to apply it. When you write and have learned the rules, it works. So there are some benefits to grammar learning. But when you speak German, all your learned knowledge becomes mostly useless. Learning phrases can be helpful as well. Who doesn’t want to learn basic German phrases like “guten Tag”, “danke”, and “Rindfleischetikettierungsüberwachungsaufgabenübertragungsgesetz” – you know, words we Germans use all the time. It helps you connect with Germans when you meet them, even if you don’t speak fluent German yet. Learned German phrases can be incredibly useful to move the conversation forward so that you get… more comprehensible input! Just don’t overuse them. The natural method is often contrasted with “traditional” language learning methods, but it’s probably the reverse: The natural method is the traditional one – the one that people have almost always used in the past –, and the grammar-based approaches are new inventions that needlessly made language learning inefficient and complicated. It’s called “approach” rather than method because a method implies a particular set of features. The natural approach, however, starts with certain basic principles. Affiliate disclosure: Links marked with an asterisk (*) are affiliate links to products I think can help you. If you make a purchase after clicking one of these links, there are no additional costs to you and you help me out so that I can create even more helpful content for you.